Wild turkey verses the common Thanksgiving Day turkey — we consider the history of these birds and the unique traits of each. For many hunters the turkey is a symbol of spring. When the weather begins to warm and winter-dry foliage turns green once again, it’s a signal that turkey season is almost upon us. For an even larger population in the United States, though, the turkey is most closely associated with fall — specifically Thanksgiving dinners where these birds are served up with stuffing, mashed potatoes and gravy. But most Americans aren’t consuming the same turkey for Thanksgiving that wild-turkey hunters pursue in the spring woods. Wild turkeys were domesticated rather recently — at least when compared to other common barnyard animals. Whereas cattle, pigs, cats, dogs and chickens have all been part of human life for at least 10,000 years, science tells us that the first turkeys were domesticated around 2,000 years ago. Additionally, turkeys were one of the few species that were domesticated on this continent. Our familiar sheep, cows, goats, dogs, cats and chickens all trace back to wild animals in Europe or Asia. The turkey, however, has its roots firmly planted in North America. Mesoamerican cultures first began raising turkeys between 2,000 and 3,000 years ago according to archeological evidence, but a journal article in the Proceedings of the National Academy of Sciences shows that the Anasazi people of the southwestern United States also domesticated these birds. Not only for their meat, but also for their feathers. The latter was used for ceremonial dress, while turkey bones served as tools. Spanish conquistadors arriving in what is now Central America were impressed by the large birds that the Aztecs kept in their villages, both for their size and the quality of the meat they produced. One of the great prizes that the conquistadores carried back to Europe from the Americas in the 1500s was not boatloads of gold or a map to the fountain of youth, but rather the domesticated wild turkey. After being introduced to Spain the wild turkey became a fixture in Europe. A century later, Europeans who set out to explore the New England shores brought these domesticated birds with them — only to find the American wilderness was already stocked with wild turkeys. Domestication has resulted in turkeys that are larger, heavier and more docile. These domesticated turkeys produce more meat at a younger age. Currently there are a number of domestic turkey breeds including the Broad Breasted White, the favorite bird of commercial turkey farmers (and very likely the bird that lands upon your Thanksgiving plate between the sweet potatoes and cranberry jelly), the Broad Breasted Bronze, Bourbon White, Narragansett and Spanish Black. The latter derived from the first birds brought to Spain. These modern birds found in American supermarkets represent a mix of genetics from the original turkeys first brought to this country by European settlers and captured native birds. So, how closely are domesticated, store-bought turkeys related to their wild turkey cousins? Domestication quickly alters the genetics of any species since natural selection is no longer the primary driving force and selective breeding for desirable traits becomes the primary objective. Rather than the strong-flying, wary, lean birds which formed the basis of wild populations, domestic birds were bred to be docile and heavy. While both wild and domestic turkeys share similar DNA, they are two very different birds indeed. Laws prevent farmers from releasing their birds into the wild, primarily out of fear that domestic birds could spread disease to wild populations. Do wild turkeys ever breed with domestic turkeys? Yes, but the odds of that are very rare. For generations, wild turkeys have adapted to survive in the wild. They can find food, sort out the best roosting locations, build nests, and—perhaps most importantly—they are evolved to avoiding predation. 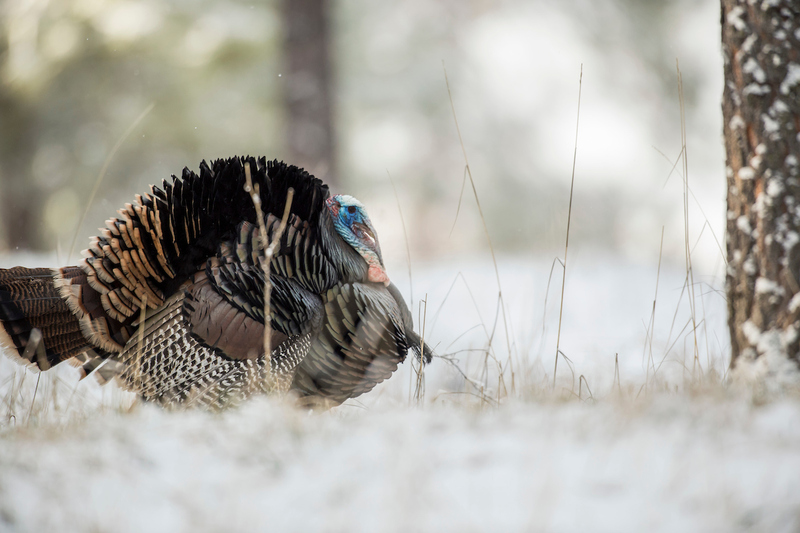 Domestic turkeys stand little chance against wild predators like coyotes and bobcats and, as such, these liberated pen-raised birds usually meet a quick end in the wild. Though the domestic turkey is related to its wild cousin, they are many, many times removed. You can’t compare the rather dim-witted modern farm bird to their wilder relatives. The silver lining? Thanks to thousands of years of domestication, you won’t have to go hungry on Thanksgiving if a big gobbler fools you in the woods.